High winds sent three of the four light poles at Ponder High School’s Lion Stadium crashing to the ground Thursday night, just before the start of a junior high football game. “Everyone was inside and safe and next thing they knew, they looked outside and the light poles are bent over,” said Bruce Yeager, superintendent of the Ponder Independent School District. “Those poles were put up in 2008, so they’re relatively new and it’s a surprise to us." Without lights, Friday night’s varsity home football game was to be played at Bowie High School. 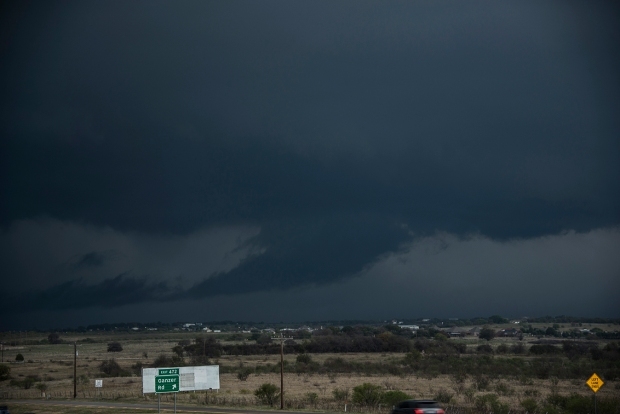 Drivers scrambled to get off the roads when the storms blew though Denton County, many seeking shelter at the Travel Centers of America truck stop along Interstate 35. “It was too scary to go any further, it was pretty wild,” said Crystal Vance, of Sanger. “Sit it out. It ain’t worth risking, losing your life, that’s for sure,” said Jimmy Morehead, a truck driver from Oklahoma.